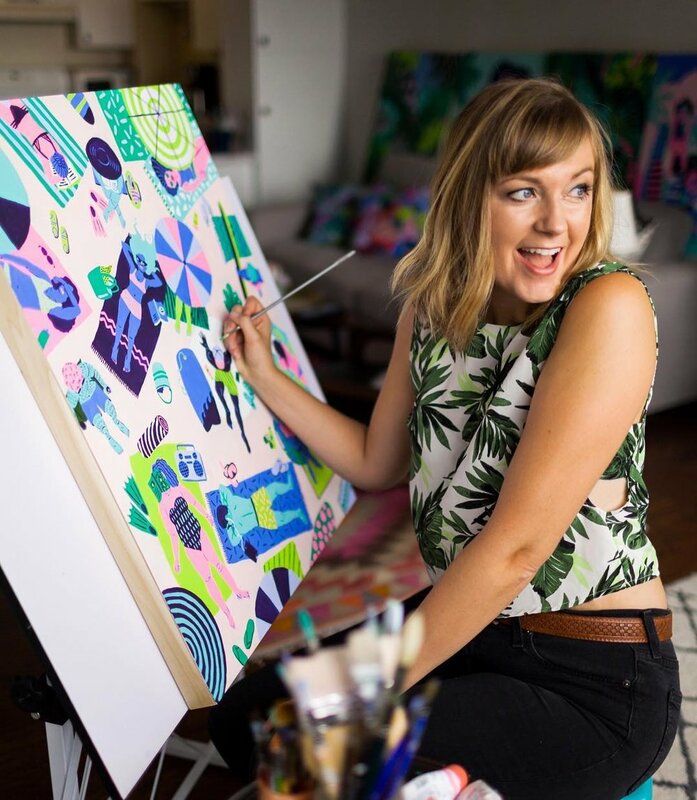 Kim is an illustrator, painter, and surface designer. She was born in Alaska, and moved all around the U.S. in a Coast Guard family. Kim was greatly influenced by her few years living in Hawaii as a child, and recently moved back after eleven years in New York City. When not creating colorful, fun art, Kim is traveling to new places far and wide, playing surf guitar in her band Puppies, reading, hiking all the trails in Hawaii, or trying to figure out how to get on a sailboat. She really misses the pizza of New York City, but can't really complain because... Hawaii. Select Client List: Pepsi Co, Capital One, Nylon, 21st Amendment Brewery, Cocofloss, Propercorn, Buzzfeed, Ten Speed Press, Ethical Wine and Spirits, Aelfie, Seventeen, Travel + Leisure Magazine, Izzy Wheels, Time Out New York, NooWorks, FLUX, Cra-Z-Art, BUST Magazine, Honolulu Magazine, She Shreds Magazine, Seaport Music Festival, Bustin Skateboards, The Club of Odd Volumes, Rhode Island Monthly, Charlotte Magazine, Milwaukee Magazine, Ski Magazine, Annibale Records, Bushwick School of Music, Alt Citizen Magazine, Akjak Films, American Cowboy Magazine, Desert Island, Backpacker Magazine, Hemispheres Magazine, PKNY tiki bar. Please email for commissioned work, potential jobs, and original paintings. For high quality prints, postcards, and ceramics, please visit my shop.